A call to Moran Yacht & Ship confirms that they’ve closed on their listing for sale the 37.4 metre motor yacht St Vitamin, in an in-house deal. 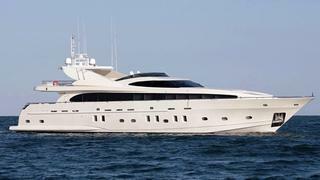 St Vitamin was built by Spain’s Astondoa yard as one of the GLX series and was launched in 2005. An interior by Versace is classically inspired and features African walnut paneling, Versace furniture, and high-end crockery and glassware. Accommodation is for 12 guests in six luxurious staterooms and all have en suite bathroom facilities. A comprehensive refit in 2013 included the installation of satellite television and fast broadband internet and she is now in impeccable condition. Extras included in the sale were her recently purchased tender, a Jet Ski and scuba diving equipment, while triple 2,636hp MTU engines give her a maximum speed of 34 knots. St Vitamin was asking €5 million.